DIESEL REEN 0844T. Wash ; 0844T. W28 L32 UK10-12. size W28 L32 uk 10-12 32"leg. waistband 30" (15"flat) (size w28) uk 10-12. Thighs 23" (11.5"flat). Wash Code: 0R48B. 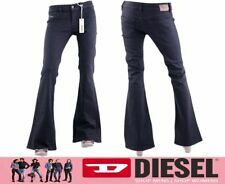 Diesel – is an Italian fashion label, founded in 1978. Super Slim Flare. ONLINE SUPPORT. W27 uk 8-10. waistband 29-30" (14.5"flat) size W27 uk8-10. Cut; straight,to ankle, shrunken design. DIESEL RIZZO-NE JOGGJEAN. leg bottom width 12" (6"flat). 90% Cotton,8% Polyester,2% Elastane-Spandex. JOGGJEAN 0673M. Wash; 0673M. waistband 32" (16"flat) size w29 uk 12. Cut; straight,to ankle, shrunken design. DIESEL RIZZO-NE. Inseam 29"to fit 30-34"leg as designed. leg bottoms 12" (6"flat). Thighs 22" (11"flat). Wash Code: 0826F. 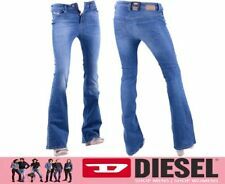 Diesel – is an Italian fashion label, founded in 1978. Super Slim Flare. ONLINE SUPPORT. Information Links. W27 uk 8-10. DIESEL RIZZO-NE JOGGJEAN. leg bottom width 12" (6"flat). 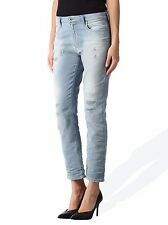 Cut; High waist, straight,to ankle, shrunken design. 90% Cotton,8% Polyester,2% Elastane-Spandex. 21 (10.5"flat).